“I would like to express my appreciation to the IDF soldiers who foiled an attack in the north today. I would also like to send my best wishes for a quick and complete recovery to our wounded. We have proven that we respond strongly to any attempt to attack us be it in the south, the north or any other sector. We have also witnessed the threats that are gathering round us, threats that the entire world is aware of and some of which it is dealing with. These threats require us to invest considerable sums in security and in the communities close to the confrontation line. For this reason, I have asked that the tax benefits for these communities be extended; I have spoken about this with Finance Minister Yair Lapid and I think that the matter has been resolved. There is a realignment of forces in the Middle East based on the common concern with the dangers posed by radical Islamic terrorists. I’d like to see if we can translate this understanding of our common challenges into cooperation and the achievement of peace between Israel and our Palestinian neighbors. Upon the establishment of the ceasefire, I can say that there is a major military achievement here, as well as a major diplomatic achievement for the State of Israel. Hamas was hit hard and it did not receive even a single one of the conditions that it set for a ceasefire, not even one. As Prime Minister of Israel, I hold the supreme responsibility for the security of Israel’s citizens and this is what guided my colleagues – Defense Minister Moshe Yaalon and IDF Chief-of-Staff Lt.-Gen. Benny Gantz – and I during each stage of Operation Protective Edge. I would like to take this opportunity to thank you for the cooperation and the joint work for the security of Israel’s citizens. From the first moment we set a clear goal: The goal was to strike hard at Hamas and the terrorist organizations and in so doing bring prolonged quiet to all Israeli citizens. I can say that Hamas was indeed hit very hard. First of all, we destroyed the network of attack tunnels that it built over the years. I would like to make it clear that we introduced the ground force for this goal. When the mission was completed, when the IDF reported to us that this mission had been completed, we pulled the force back in order to deny Hamas the possibility of killing our soldiers or abducting them, goals that it very much aspired to. We continued to attack from the air. Approximately 1,000 terrorists were killed, including senior terrorists, very senior terrorists from among its top command. We destroyed thousands of rockets, rocket launchers, rocket production facilities and other weapons, arsenals, command and control positions, hundreds of command positions, hundreds. We also foiled, of course, attempts by Hamas to attack us by land, sea and air. Above all, thanks to Iron Dome, we foiled hundreds of attempts by Hamas to kill very many Israeli civilians. This was achieved, inter alia, thanks to a decision I made as Prime Minister, in my previous term, to equip the State of Israel with thousands of interceptors which, of course, blocked the murderous aerial assault by Hamas and the other terrorist organizations. The blow that Hamas has now taken is unprecedented since it was founded, a very hard blow. I must say that it also took a diplomatic hit. See, Hamas set conditions at the outset for a ceasefire. We accepted the Egyptian initiative for a ceasefire, already in the first days, unconditionally and without time constraints whereas Hamas set conditions. It demanded a seaport – it did not get one. It demanded an airport, it did not get one. It demanded the release of the Shalit prisoners, those who were released in the Shalit deal whom we returned to prison following the murder of the three youths, it did not get this. It demanded Qatari mediation, it did not get it. It demanded Turkish mediation, it did not get it. It did not receive any condition. It demanded further conditions. It demanded the rehabilitation of the institutions that we dissolved in Judea and Samaria, it did not get this. It demanded salaries and money from us, it didn’t get them. It did not receive any of the conditions that it set. We agreed at the outset to one thing – to carry out the humanitarian rehabilitation of the Gaza Strip, with supervisory mechanisms and oversight abilities in our hands. This is in order to prevent the entry of weapons or materials that could be used to produce weapons. We have always agreed to this but we did not agree to accept any of Hamas’s conditions and the fact is that this ceasefire was achieved without the conditions that it set. Moreover, I think that Hamas is also isolated diplomatically. We received international legitimacy from the global community. First of all, we received 50 days for very strong action against the terrorist organizations. This was substantial. I think that we also instilled in the international community the fact that Hamas, ISIS and Al Qaida and other extremist Islamic terrorist organizations are members of the same family. We also instilled the understanding that the long-term goal is the demilitarization of Hamas and the terrorist organizations, the demilitarization of the Gaza Strip. All of these are important achievements alongside the realignment of regional forces in the Middle East. The regional change of moderate forces in the Middle East is creating a possible diplomatic horizon for the State of Israel. I think that it contains within it new possibilities for our country. We will certainly try to advance these possibilities in a responsible and prudent manner as we have done up until now. Will we achieve our goal for prolonged calm? I think it is still too early to say but I can say that the harsh blow that Hamas and the terrorist organizations have taken, as well as our ability, via border controls, to prevent their rearming increase the chances that this goal will be achieved. I can say that Hamas was surprised by two major things. One, in recent days it was surprised by the strength of our response to the violation of the most recent ceasefire. It thought that we would give in in the end to its conditions – and we did not give in. It thought that it could wear us down. You remember that I told it that it would not wear us down but would instead be hit very hard. I would like to take this opportunity to say that if it resumes firing, we will not tolerate sporadic firing at any part of the State of Israel and how we have responded up until now – we will respond with even greater strength. We are prepared for any possibility. The second thing that surprised Hamas, Israeli citizens, is your splendid unity. I must say that it simply did not correctly appreciate the unity and strength of the people, and it is a splendid unity. It is the unity of civilian volunteers who helped the heroic IDF soldiers by sending packages, going to every point in person, of the rescue and voluntary organizations such as Magen David Adom and the other organizations, of the kibbutz movement that hosted residents of the south, of the local council heads who also volunteered to do this, and of ordinary citizens who went from place to place including hospitals to help our wounded heroic soldiers. Our marvelous soldiers – during our visit to an air force base today, the Defense Minister, the Chief-of-Staff and I, I told air force personnel – air and ground crews – what I say to all IDF soldiers: The entire nation owes you its deep gratitude. Your stepping up, your heroism and your dedication, all of these were decisive in the campaign and made major contributions to our present diplomatic and military achievements. One soldier told me, on one of my visits to the south, would that this unity which gives us so much strength as we go to fight the enemy, would that this unity could continue even after the fighting is over. And I say would that it could, amen, because this is a basic part of our national resilience. And on behalf of all of you, on behalf of this unity, I would like to send my best wishes for a quick and complete recovery to our wounded soldiers. I visited them, not all of them, but as many as I could, and I was impressed by their strength of spirit. I was impressed by the public’s and their families’ great love for them. Everyone of them is dear to me just as every one of our fallen soldiers is dear to me. And their families, I know their loss and the depth of their pain and sorrow, to the families this evening I say the words that we read a few weeks ago in the haftarah [from the prophet Isaiah (40:1)], ‘Comfort you, comfort you, My people.’ And comfort may be taken in the strong and united nation that stands here on it land, the Land of Israel, and which is determined to defend our state, the State of Israel, with your support, with your splendid unity. We acted just as we promised all through the operation – with level-headedness and responsibility, with foresight broad enough to ensure your security, citizens of Israel. Prime Minister Netanyahu: “I think that there is a realignment of forces in the Middle East. Everybody can see that. The realignment is based on the common concern with the dangers posed by radical Islamic terrorists who are sweeping the region with a ring of fire. And many understand that this is a danger to them. As we understand, it’s a danger to us. And many certainly begin to view Israel less than the full, or an enemy than a potential ally in this common battle. “Hamas and the other terrorist organizations were dealt a heavy blow during the last 50 days. More than a thousand terrorists were killed, including senior members of the military wing. Terrorist infrastructures were destroyed. We attacked and destroyed weapons, launchers, rockets, homes of commanders, and command and control centers. We struck at the terrorists capabilities, including terrorist tunnels prepared over the course of years. We set Hamas and other terrorist organizations back many years. Gaza does not look like it looked on the eve of the operation, and it is no surprise that the discourse in Gaza, and within Hamas, is one of anger and frustration. We are talking about a at least ten years of restoration and rehabilitation. When the dust clears over the Gaza Strip, Hamas leaders will have to answer quite a few tough questions following the hard, unprecedented blow inflicted upon them by Israel. This operation will end only when quiet and security are restored to the citizens of Israel for a lengthy period. We have no intention of attacking the residents of Gaza. In practice, it is Hamas that is attacking them and denying them humanitarian aid. “The campaign in Gaza is continuing. What is about to conclude is the IDF action to deal with the tunnels but this operation will end only when quiet and security are restored to the citizens of Israel for a lengthy period. We struck a very severe blow at Hamas and the other terrorist organizations. We have no intention of attacking the residents of Gaza. In practice, it is Hamas that is attacking them and denying them humanitarian aid. I think that the international community needs to strongly condemn Hamas and also demand, just as we are demanding, that the rehabilitation of Gaza be linked to its demilitarization. I would like to express special appreciation for the Defense Minister, the Chief-of-Staff, GOC Southern Command, our heroic soldiers and commanders, and also the ISA, which has been assisting them. There has been very strong teamwork here the goal of which is to bring security to the citizens of Israel and the State of Israel. I express deep appreciation to all of our soldiers for their fighting spirit under difficult conditions, in urban areas with tunnels. There are many stories of heroism here. I am impressed by the effort and by the operations in the field. We will not complete the operation without neutralizing the tunnels, the sole purpose of which is the destruction of our civilians and the killing of our children. This is the clear and unequivocal objective of the State of Israel. “First, I would like to share in the grief of the families whose dear ones have fallen. They have fallen in defense of the nation and we all mourn their passing. There is no more just war than this one that our heroic sons are fighting. I would like to support the soldiers of the IDF who, even now, are continuing to operate inside the Gaza Strip against our enemies. We knew that there would be difficult days; this has been a difficult and painful day. Patience and determination are needed in order to continue the struggle against a murderous terrorist organization that aspires to our destruction. We are, at present, continuing to take action to neutralize and strike at the terrorist tunnels. We will not complete the mission, we will not complete the operation, without neutralizing the tunnels, the sole purpose of which is the destruction of our civilians and the killing of our children. This is the clear and unequivocal objective of the State of Israel and the need for it has been apparent again today. The operation against the tunnels is a first and necessary step in the demilitarization of the Gaza Strip. The process of preventing the arming of the terrorist organization and demilitarizing the Gaza Strip must be part of any solution. The international community needs to demand this explicitly. Instead of the international community allowing funds to enter the Gaza Strip, via Hamas, for concrete and cement to serve in the unlimited construction of tunnels, there must be monitoring and supervision. In the past, when we raised these demands and these concerns of ours, we were not taken seriously. This has to change. It cannot be that citizens of the State of Israel will live under the deadly threats of missiles and infiltration through tunnels – death from above and death from below. ראש הממשלה ושר הביטחון הנחו את צה”ל לפתוח הלילה בפעולה קרקעית כדי לפגוע במנהרות טרור החודרות מרצועת עזה לשטח ישראל. במנהרת טרור כזאת חדרו לפנות בוקר מחבלי חמאס לשטח ישראל, במטרה לבצע פיגוע המוני נגד אזרחי ישראל. צה”ל סיכל בהצלחה גם את פעולת הטרור הזאת. ראש הממשלה ושר הביטחון הנחו את צה”ל להיות ערוך להרחבת הפעולה הקרקעית. ההוראה לפעולה הלילה קיבלה את אישור הקבינט אחרי שישראל הסכימה להצעה המצרית להפסקת אש ואילו החמאס דחה אותה והמשיך בירי רקטות על ערי ישראל. החמאס גם לא כיבד את הפסקת האש ההומניטארית שיזם האו”ם, והמשיך בירי על ישראל בזמן ההפוגה. לאור התוקפנות הנפשעת והבלתי פוסקת של החמאס, והחדירה המסוכנת לשטחה של ישראל, ישראל מחויבת לפעול להגנת אזרחיה. מבצע צוק איתן יימשך עד להשגת מטרתו – להשיב לאזרחי ישראל את השקט לתקופה ממושכת, תוך פגיעה משמעותית בתשתיות חמאס ושאר ארגוני הטרור ברצועת עזה. Prime Minister Benjamin Netanyahu and Defense Minister Moshe Yaalon, this evening instructed the IDF to commence ground action to strike at the terrorist tunnels from the Gaza Strip into Israeli territory. Hamas terrorists used such a tunnel to infiltrate into Israel this morning in order to perpetrate a large-scale attack against Israeli citizens. The IDF successfully thwarted this terrorist action. Prime Minister Netanyahu and Defense Minister Yaalon also instructed the IDF to be prepared for an expansion of the ground action. The directive for ground action was approved by the Security Cabinet after Israel agreed to the Egyptian ceasefire proposal, whereas Hamas rejected it and continued firing rockets at Israeli cities. Hamas also did not honor the humanitarian ceasefire initiated by the UN and continued firing at Israeli cities during the lull. In light of Hamas’ criminal and relentless aggression, as well as the dangerous attempt to infiltrate Israeli territory, Israel must act to defend its citizens. 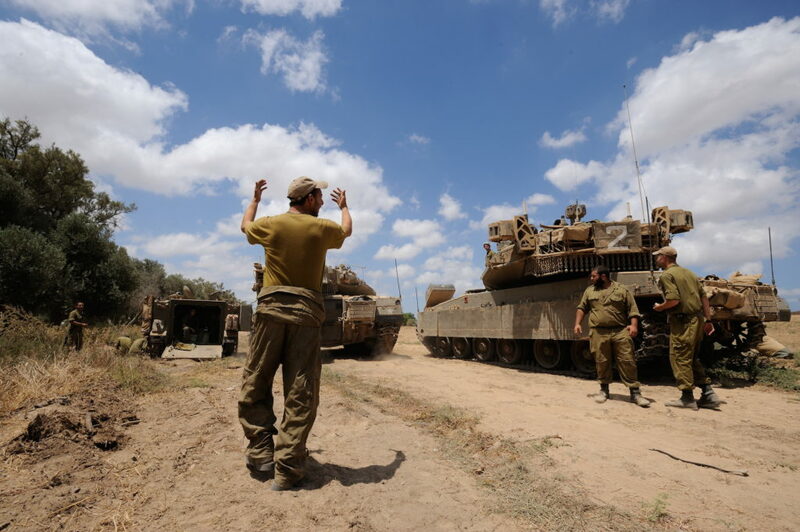 Operation Protective Edge will continue until it reaches its goal – restoring quiet to Israel’s citizens for a prolonged period, while inflicting a significant blow to the infrastructures of Hamas and the other terrorist organizations. “Today we welcome the Secretary General of the OECD, our friend Angel Gurria. Angel Gurria played an important role in our entry to the OECD, which I and previous finance minister, Yuval Steinitz, worked very hard to achieve, as well as governments before ours. Membership in this important organization of the world’s leading economies gives us objective criteria by which to compare the Israeli economy and Israeli society to other countries, and to find ways to improve what needs improving. I must say that in this international comparison, as we will soon hear from the OECD Secretary General, Israel is in a pretty good situation: Growth is among the highest in the developed countries, unemployment is among the lowest in the world and Israel is implementing many good things according to other indices as well, including health in which we are ranked very high. I am also pleased that this report focuses on high-tech. I just sat with the OECD Secy.-Gen. and I told him what we are doing in the cyber field – to turn Be’er Sheva into a global cyber capital, which will enable many investors and companies from the private sector to come to Israel. I call on them to do this, they are doing it without me, but there is no doubt that this will continue and grow as part of the Israeli engine for participating in the global economy. Alongside all the good things, we also heard about things that we need to improve, including the gaps within the State of Israel, which are wide in comparison to the world’s economies, especially the non-participation of parts of our population – the ultra-orthodox and the Arabs – which must be integrated into the Israeli labor force, and of course other things that need correcting, including in advancing our education system, in carrying out international tests. I recently spoke about this with the Education Minister, how we might continue the trend of improvement and strengthen it so that Israeli children will be equipped with the tools to compete in tomorrow’s world. I think that all of this is helped by these reports. They are very interesting and compare us to others. We have greatly improved. In the past decade, we have overtaken most of the countries here. We made greater progress than they did and we must ensure that this trend continues in the coming decade according to all the main indicators. On closing the gaps, I would say that there will be more people who will participate and benefit from growth. This is the main thing that I would say that we need to do, but we must ensure that there will be benefits. The allocation of the benefits is also important, but it is possible only if there are benefits. Creating growth is the critical thing that we are committed to.